Upon starting graduate school in 1997, nearly two decades after finishing college, I rediscovered academic jargon. Among the variety of new words and terms, one in particular really cracked me up and still does. This is the concept of “unpacking” an event, a tradition, an idea, a person’s life – anything that you want to take apart in order to understand it. I’d just as soon explicate, deconstruct or interpret. But there is one case where none of those words will do. That is when I am unpacking Otto Luyties. This is how I imagine it. Otto is tall and thin but somehow he has been fitted into a large black trunk. When he jumps out, papers fly everywhere including his patent applications for a self-bolting locknut and a non-glaring dome-shaped frosted car headlight. Not to mention sheaves of blueprints for the helicopter he invented, and a copy of the New York Times story in which he insisted that Congress must appropriate no less than $9 million if New York City could expect to stave off a sea attack by the Kaiser’s navy. The son of a German immigrant named Henry Edward Godfrey Luyties, who co-founded a vastly successful wine and liquor emporium in Manhattan, Otto grew up in high society. Unfortunately in 1905, on the verge of becoming a candidate for membership at the New York Athletic Club, Henry E.G. died of pneumonia. On his deathbed, at least Henry knew that Otto had graduated from MIT and launched a career as an engineer. Between 1900 and 1908, Otto developed an “airship scheme” to build a “helicopter which belongs properly in the class with the aeroplane” according to a newspaper report. 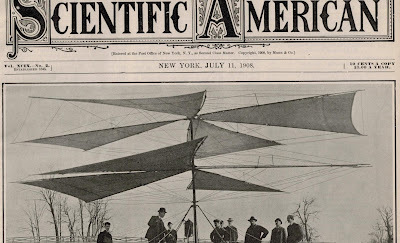 Autogyros, cyclogyros, gyroplanes – Otto’s rotary helicopter with canvas blades was one of hundreds of flying machines invented by Americans and Europeans during the first decade of the 20th century. Otto once wrote that the helicopter had been neglected as a superior alternative to the airplane since Leonardo proposed it around 1500. Working with Professor Robert Wood of the Physical Department at Johns Hopkins University, Otto showed off his invention on a marshy inlet called Sparrow’s Point near Baltimore in 1908. It does not appear that his design won the award for gasless machines that he sought, but the story did end up on the cover of Scientific American. A few months before the demonstration, Otto challenged a champion swimmer to a fist fight at the Baltimore Athletic Club. “You have been talking about me,” Luyties told the athlete, Roy Nelson. “We will have to settle this matter and there is but one way to settle it and that is in the brutal American style. I must have satisfaction.” After receiving a stiff punch in his stomach, Otto dropped his guard and went down. It’s puzzling that Otto would display such animosity. Of course, some of the best-known inventors such as Henry Ford and Thomas Edison had notoriously bad tempers. Soon after the fight and the helicopter demonstration, Otto left Baltimore and moved back to Manhattan where he consulted on various engineering projects. As head of the family since his father’s death, Otto would now devote time to his disappearing younger brother and sister's declining marriage.